Location Data Missing From Some Images. AE should be transferring GPS data whether it was added in Aperture, by your camera, or another source. 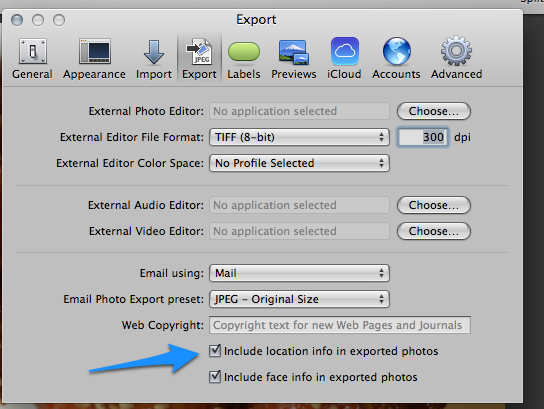 If Aperture is aware of the location, then it should be included in the exported image. From experience with another product called RawHide we’ve discovered a weird situation with Aperture that sometimes prevents it from happening though. It’s either an Aperture bug, or a problem with the user default plist settings. None of this is the user’s fault. In the Aperture preferences, select the Export tab and ensure that “Include location info” is selected. If it is already, toggle it off then back on again. Hopefully that will fix things for you. If not, please contact us and we will try to help you further.